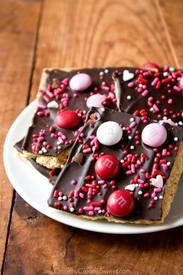 Chocolate bark is one of the easiest sweet treats you can make. Layer the crackers on the bottom of a baking sheet, spread melted chocolate on top and decorate with candy of your choice. Done and done!